AFC Fylde goalscorer Simon Grand wants his disappointed team-mates to dwell only on the positives from this week’s agonising FA Cup exit at Wigan. Goals by Grand and Danny Rowe took the Coasters within 10 minutes of a second-round shock away to the League One leaders only for two late Will Grigg strikes to seal Wigan's 3-2 win and a trip to Premier League Bournemouth in the next round. 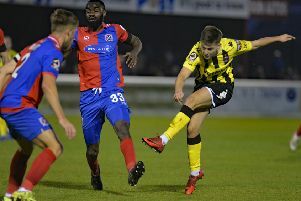 Experienced centre-half Simon Grand, making his first start since mid-October, said: “We were obviously very disappointed and there were a lot of heads down in the changing room, but there is an awful lot that we can take heart from. “We have a young squad and it’s up to the experienced lads to pick them up and take the positives from the game. “To lose the game so late on was massively disappointing. I think their quality just edged it in the end because it certainly wasn’t through a lack of effort on our part. “We were realistic and we knew there would be long spells when we would have to dig in and try to nullify the threat. But when you have a player like Danny Rowe you know there’s always a chance of a goal. “The FA Cup throws up chances like that and it was all going to plan. It’s just frustrating that we couldn’t see it out. “It was a great stadium to play in and the younger lads have to aspire to be playing at places like that on a regular basis. There’s no reason why a lot of them can’t do that. Speaking of his equalising goal, Grand said: “I always set myself a target of goals and I seem to be one of the lucky ones because the ball always seems to drop to me in the box. Over 500 Fylde fans made the trip to Wigan and Grand was full of praise for the travelling support. The Coasters remain in cup mode this weekend with a trip to Chester in the first round of the FA Trophy. Grand said: “Realistically this is our best chance of getting to Wembley. The highest ranked team in the competition is the team that’s top of our league, so we are in with every chance.